Directly below are my speaking notes for talks I gave to the Northern Brazoria County Democrats and Southern Brazoria County Democrats back in May 2010 in response to a very problematic resolution issued by Brazoria County. Part one of this posting can be found here. You should be able to enlarge, if desired, by clicking and then using your Web browser’s zoom function. In April 2010, as you may know, the Brazoria county judge and four county commissioners signed a “Resolution” addressing issues pertinent to the Civil War. This “Resolution” is actually identical to one issued by the state of Texas in 1999. I brought copies of this for everyone. Please take a second to look at it. 3) that the war was not started or fought because of slavery but was fought to protect homes and heritage. I am against this “Resolution” on ethical and historical grounds, and I would like to address some of these today. Please understand that my position is not political. My position is moral and historical. Let me start by asking you a question. So, we are in Lake Jackson. We all know this city is named after Abner Jackson. Someone take a guess as to how many enslaved peoples he had? He had at least 300 enslaved African-Americans on three plantations and most certainly many more because numbers were always purposely underreported. He was the county’s largest plantation owner. And he was in the state of Texas’s top three enslavers. So now if you had to guess, what percentage of the population in Brazoria County was enslaved in 1860? In 1860, at least 72 percent of all people in Brazoria County were enslaved. More specifically, there were 2,027 Whites; 5,110 enslaved African-Americans; and 6 free African-Americans. In the decade leading to the Civil War, plantation life greatly increased in Brazoria County, making it the richest county in Texas. There were 46 plantations in this county that produced sugar and cotton. Some plantations also cultivated oranges and lemons and raised cattle. Enslaved African-Americans in Brazoria County produced 3/4s of the entire state of Texas’s output. But, Brazoria County did not act in isolation. Slavery was an important cultural, economic, political, and social institution throughout the state of Texas. First, to go back in time before 1860, we have all heard about the Texas Revolution. Many of us have heard that it was about fighting a repressive and uncaring Mexican government led by Antonio López de Santa Anna. While there were important conflicts between those living in Texas and Mexico, especially issues of immigration and control, the main issue was actually slavery. With its independence from Spain, the Mexican government had abolished slavery in 1829. Texans refused to comply. A few years later they declared war and won the Texas Revolution to maintain and spread slavery. It was also planned that Texas would join the United States as another slave state. Once independent Texas wrote its own constitution. The Republic of Texas constitution: 1) guaranteed slavery, 2) made all Whites, and only Whites citizens, 3) and in addition to limiting citizenship to Whites, it said that free Blacks and Indians cannot reside anywhere in the state. Texans fought the Texas Revolution to maintain slavery and then guaranteed that right with its independence. From 1845-1865, the practice of enslavement greatly expanded in Texas. In 1836, there were only 5K enslaved people in Texas – total population about 38K. In 1860, there were 128K, representing 30 percent on the population. Slavery was present in at least 2/5 of the state. In 1860, these 182K enslaved African-Americans were kept enslaved by 120K families, 30 percent of the free population. Moreover, this 30 percent of slave owners controlled 68 percent of all public offices in the state. Now I want to briefly talk about causes of the war. Popular culture, news media, and others frequently give many different and contradictory reasons. Brazoria County’s “Resolution” regretfully reinforces this belief. So, how many at some point were told in school or read somewhere that the war was over “states’ rights”? However much parts of our society want to belief that, it is not true. The war was caused by the continued conflicts over slavery. Of course, there were many issues that resulted in the Civil War, but all of the issues directly and specifically point to slavery. These side issues include land expansion AND the conflict between abolitionists and those who created and spread pro-slavery arguments. ALL evidence indicates that soldiers, politicians, and everyone else fought the war because of slavery. The notion that “states’ rights” had anything to do with the war was not created until well AFTER the Civil War. As tension built throughout the nation over the issue of slavery, South Carolina announced that it was leaving the Union in December 1860. Starting in December 1860, following the lead of South Carolina and other states in the Old South, Texans voted on whether or not to join the Confederate States of America in 1861. With the exception of a handful of counties, the majority of Texans voted to join the Confederacy. 122 counties were for it, 18 were against it. Someone take a guess as to what the vote was in Brazoria County? 99.6 percent of the vote in Brazoria County was for secession: 527 for, 2 against. So to reiterate in 1860, 72 percent of Brazoria County’s population consisted of enslaved persons, while the state of Texas specifically AND the south in general as a whole had 30 percent of their population enslaved. Brazoria County had many rich plantation owners who were committed to keeping their enslaved peoples and who sought to maintain White supremacy. Enslaved Africans in Brazoria County created the wealth that made Brazoria County the richest county in the state. In other words, about 3 out of 4 people were not paid for their work. Upon asserting its plan to leave the Union, each state wrote up why they were leaving. These secession papers provide a key insight into why southern states fought the war. Everything in the secession papers points to slavery. On another note concerning the “Resolution,” it says that 98 percent of those who fought in the war never owned a slave. This claim does not make sense. 25 percent of Southerners owned enslaved peoples as a family, 30 percent in Texas. The best data estimates that the total Texas population in 1860 included 92K White men of fighting age and about 90K of these fought in the war. So this means/seems to indicate very clearly that at least 20 percent of those who fought in the war directly owned enslaved peoples OR someone in their immediate family owned them. And it really does not matter if one specifically owned enslaved people or not. Slavery was a cultural, economic, and political system that benefited virtually everyone except those who were enslaved. Non enslaver Whites generally supported slavery because 1) they basically had to for their own safety, 2) they had status over the enslaved Blacks, and 3) society told them they too could be rich and own enslaved people with hard work, and 4) they depended on the products and wealth produced by enslaved persons. Regardless, letters, regiment newspapers, and diaries indicate that soldiers were fighting about slavery far above and beyond anything else. Finally, I want to address the issue of memory and the war. Sometimes people say: The Civil War was almost 150 years ago, why does any of this matter? It matters for several reasons that we can address today. First, we need to support the truth, as much as possible. Without a solid and accurate understanding of our past, we cannot have nearly as full an understanding of present-day issues and concerns. Those who neglect the supreme importance of slavery in the Civil War are guilty of denial and are rewriting history. Second, it matters because 4M out of 12M were enslaved in 1860 throughout the South. 1 in 3 people in the South were enslaved. 1 in 7 in the nation as a whole. These enslaved African-Americans played an incalculable role in the development of our entire nation. It is disgraceful to undermine their place. Like we already said, the notion that so-called “states’ rights” caused the war or had any part in the war was not created until AFTER the Civil War and was done so by apologist of slavery. States’ rights had nothing to do with any of the real causes of the Civil War. And finally, we are still dealing with the legacies of slavery, as evident by the “Resolution” itself. After the war, southerners created segregation to keep African-Americans from having equality. For example, the University of Texas was created in the 1880s as an institution closed to African-Americans, as dictated by an amendment to the Texas constitution. Symbols of the Old South and of slavery are still with us. Have you ever thought about the name of the streets where Kroger and Dairy Bar are? Plantation and Dixie? 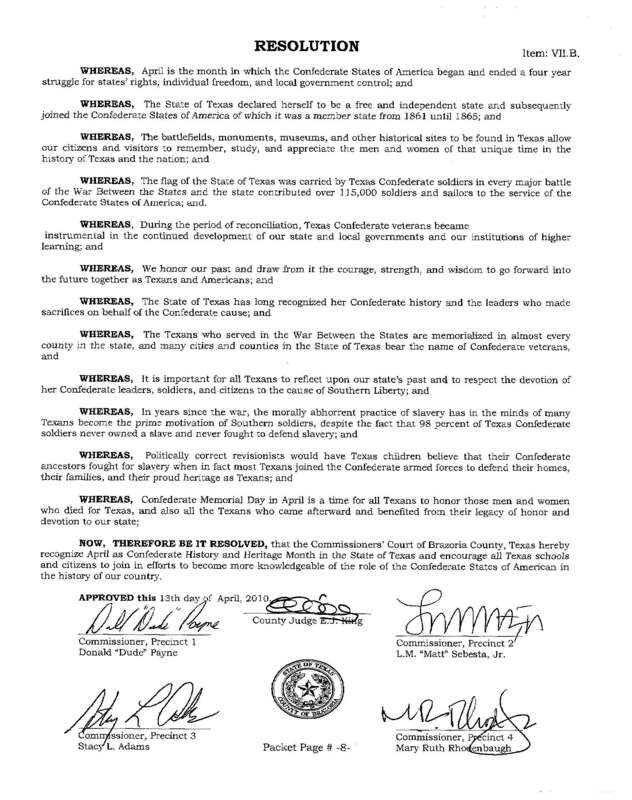 On another note, the “Resolution” calls for April to be Confederate History month. A professor at UH described this move by saying that the “declaration of Confederate History Month is an extraordinary attempt to justify a succession movement that rested solidly on a firm commitment to White supremacy.” It is absolutely essential to remember history and to discuss history, but it needs to include both the good and the bad; and it needs to be accurate. When the Civil War began in 1861 there were 4M enslaved African-Americans valued at $3B, which was 48x the federal budget. 72 percent of the population of Brazoria County was enslaved. The points discussed in this presentation today are only a few of those available. The “Resolution” signed and issued by Brazoria County has virtually no historical grounding, especially for this county. It does not speak to the truth, and this is especially important considering other contemporary debates about history. So next time you say or hear someone else say “Our Great State of Texas,” think about this: Texas was specifically created to maintain and perpetuate the enslavement of African-Americans and it continued to do so until shortly after the end of the Civil War on June 19, 1865. (And even this didn’t bring true freedom for those racialized as Black.) Historical evidence clearly supports the assertion that slavery was an important and expansionist institution throughout the South, and in Texas, especially in Brazoria County. People died to protect slavery, and people died to abolish slavery. Finally, as the Thirteenth Wisconsin Infantry Regiment said in February 1862: The fact that slavery is the sole undeniable cause of this infamous rebellion, that it is a war of, by, and for Slavery, is as plain as the noon-day sun. We can’t pick our history, but we can pick our future. Taken by Andrew Joseph Pegoda 9-7-13 during Plantation Day. This is a picture of Abner Jackson’s tree know as The Enchantment Tree. Ironically fitting, perhaps? Enchantment is also Lake Jackson’s motto. The Civil War: Causes, Myths, and Sources (Part 1 of 2) « Andrew Joseph Pegoda, A.B.D. The Raw Numbers: Texas and Enslavement | Andrew Joseph Pegoda, A.B.D.